If you’re job searching and looking for how to explain job hopping in cover letters and interviews, you’ve come to the right place. I’m going to show you everything you need to know about explaining your reasons for changing jobs, so you can get hired even if you’ve job-hopped in the past. Plus, we’ll look at the pros and cons of job hopping, and the definition of job hopping according to most employers so you can know how often you can safely change jobs. In general, you’ll be labeled a “job hopper” if you have a pattern of staying in jobs for less than a year. So that’s part of the definition of job hopping. You’re generally allowed one or two “free passes” in your career, though (depending on how long you’ve been working). Not every job is a good fit, so if you left one job in under a year, it’s usually okay and easy to explain. Also, if you’ve been working for a couple of years or more in your career, and you’ve never stayed with a company for more than two years, it can also make you seem like a job hopper – even if you always stay past the one-year milestone. For example, if you’ve held three jobs since graduating, and have left after 15 months, 19 months, and 12 months, that’s going to bring up some job hopping concerns, even though you stayed a full year at each. Leaving jobs after less than a year, especially if you’ve done it more than once. Having multiple jobs in your work history, but only staying in each job for one year or slightly longer (and never making it past two years). Okay, so you’re applying for jobs and need to explain job hopping in your cover letter. If you read the definition of job hopping above, you’ll know if your situation will cause concerns with employers. If so, you’ll want to be upfront and address these concerns in a cover letter. Be upfront and use clear/direct language. If you resigned from a job because it wasn’t working out, say, “I chose to resign because ___.” Don’t say, “we parted ways,” or some other confusing term. One of the hardest parts about explaining job hopping in a cover letter is how to bring it up to begin with. Keep this entire explanation brief. 2-3 short paragraphs or less. Don’t fill your cover letter with a huge explanation of why you changed jobs. The goal is to just give a brief explanation of why you made the choices you did, to show them you’re being upfront and you’re willing to discuss further in an interview. That’s how I’d recommend writing a cover letter to explain job hopping. Now you might be wondering, how do you know if your reason for leaving a job is good when explaining job hopping in a cover letter? You had a personal/life issue come up – like caring for a sick family member, needing major surgery or medical care, etc. Those are just a few examples of the many possible reasons you can give. If you want more ideas, here are 20 more reasons for explaining why you left a job. If you did a good job of explaining your reasons for job hopping in your cover letter, you’ll get invited to interview. But how about what to say in job interviews when you’re asked further questions? You don’t want to say something different or get your stories crossed up in the interview! You need to be 100% consistent here. And if you interview with multiple people, you need to give the same story. So make sure you know exactly what you sent them in the cover letter BEFORE walking into any interview, whether it’s a first phone interview or a face-to-face meeting. Don’t seem like you’re uncomfortable or trying to hide something. That will just make them uncomfortable hiring you. Explain what you’re looking for right now in your job search, and how your research showed that this is a good fit for your skills and for what you want to do next in your career. If you don’t seem sure of what you want, and if you don’t have a good answer for why you want this job, you will not get hired. Now that you know how employers define job hopping, and how to explain job hopping, let’s talk about pros and cons of job hopping. That way, you can make the best decisions for yourself in the future. As a recruiter, the lowest-paid people I’ve seen are the people who stayed at one company for 15-20 years. So that is *not* the solution. At the same time, I’ve seen people really struggle to get jobs after going through three or four employers in only two or three years. Once you’re labeled a serial job hopper, it’s very tough to get out of. So it’s about balance – changing jobs a few times but not too often. Here are all the pros and cons of job hopping. Higher potential salary. You usually receive a bigger pay increase when changing companies (versus receiving an annual raise with the same company). You’ll experience multiple work environments. Part of figuring out what you really like is trying a few things! You can’t know what you prefer if you’ve worked your whole life in one company. It’s better to job hop once or twice than stay in a terrible situation. Maybe you have an awful boss who is holding you back. Or maybe you were in a poisonous/toxic work environment. Getting out is MUCH better than sticking around and suffering in a bad environment. More connections/networking opportunities. If you work in many companies, you’ll come in contact with more people throughout your career. Harder time finding new jobs. At some point of job hopping, it becomes “too much” and will scare employers away and make it so that you can’t find a job, at least not without a ton of effort. Risk of becoming a jack-of-all-trades (and master of none). Trying 3 different roles in 3 years is okay, but you’re not building the same knowledge as someone in one single job usually. And this can hurt your growth and earnings if you continue doing this for too long. Deeper, stronger connections. Working with the same boss or coworkers for a long time will build a stronger bond and make them more likely to help you (or hire you again) later. The quality of your relationships is often more important than quantity. 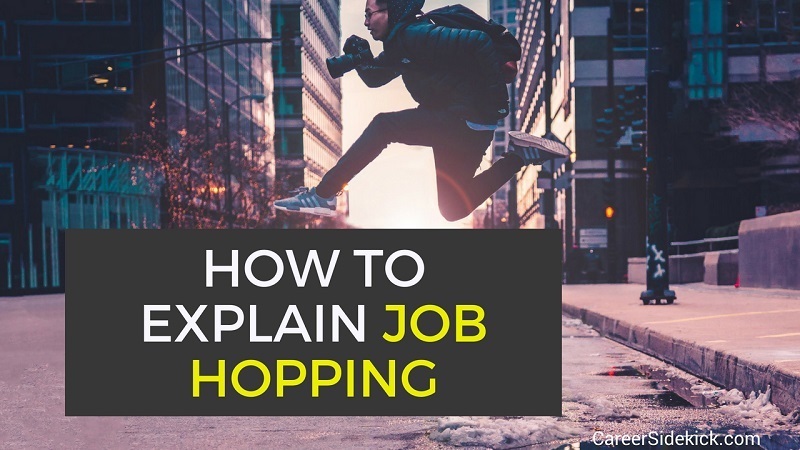 If you read this far, you now know how to explain job hopping to employers, plus the pros and cons of job hopping in the future. This will help you get hired faster and feel more confident making decisions down the road. If you still have concerns or questions about any of this, you can leave a comment below.